One of the biggest differences between Montessori parenting and other parenting styles is that Montessorians generally advocate against having a crib. We prefer floor beds, lovely, independent spaces that our children can move in and out of at will. Pinterest is full of beautiful, serene nurseries featuring floor beds, and I spent hours planning ours. Our original nursery, when Noora was still in a bassinet in our bedroom and we used her bed as her movement and mobile area during the day. Pinterest worthy floor bed room. I had a floor bed. A simple mattress, a fitted sheet with a cut up pool noodle along the edge so that Noora couldn’t just roll out, and a never ending supply of books, articles, and resources that kept assuring me this was the Montessori way and I couldn’t possibly go wrong. Until we got to 11 months and Noora still didn’t sleep through the night. Ever. She woke up every 2-3.5 hours. She crawled around her room, screaming and crying, sometimes just talking but certainly not sleeping. Had she fallen asleep on the carpet regularly, I’d have been fine with that. It would have been a relief. But she didn’t. She just cried until I came in and nursed her back down. She didn’t nap well during the day, except on day 5 of not-good napping, when she’d finally crash, sleep for 3 hours, and not go to bed until 11 or midnight. And then repeat. I was miserable. Sleep tends to exacerbate any issues one might be having, and my issues include post-partum depression. Not sleeping was killing me. Floor bed, nursery 2.0. 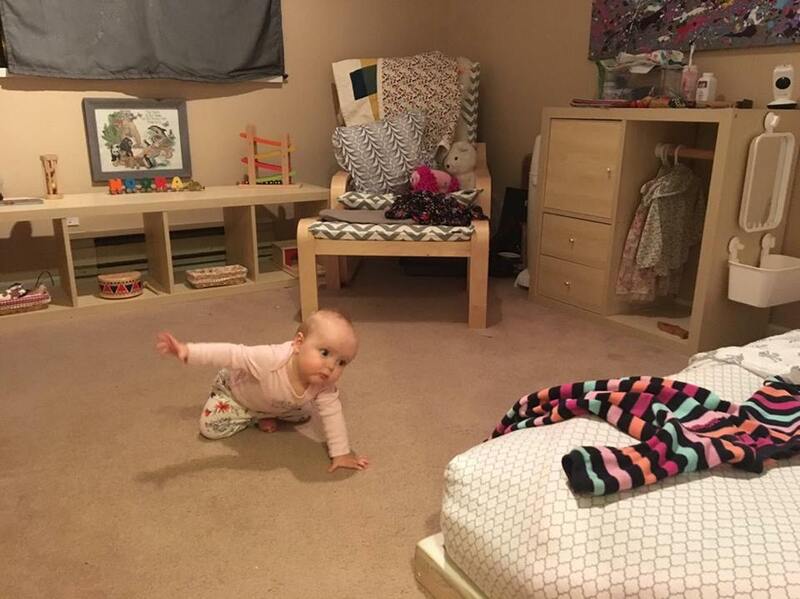 Once Noora moved out of our bedroom, we moved her mirror to the playroom, added a wardrobe, and made this a baby friendly, independent space for her, so that if she crawled out of bed, she'd be able to be in here safely. But how could I be wrong? How could I give up on this? My entire life revolves around the Montessori world, and here I was, considering throwing out a huge chunk of the philosophy. I was considering a crib and I was wracked with guilt. Then- relief. Permission. I walked into our baby Montessori class- a parent participation class led by a friend and colleague- and she, my friend, looked at me in a bit of alarm and asked if the sleeping was improving. And I passed her Noora and sat in the observation chair and tried not to sob and sob and sob in front of a class full of parents and children. Not normal behavior, certainly. And my good friend, one of the most Montessori people I know, messaged me later, making sure I was still alive and safe, and told me to just get a crib. Some babies can’t handle freedom, she said, and you’re following the child. That’s Montessori. Noora can’t handle the floor bed. Montessori is your life, she said, just like me, but this isn’t helping anyone. Get a crib. I was almost in tears building the crib, several times. I felt like I had failed as a Montessori parent and teacher. How could I preach this if I couldn't follow it? And so I did. Just to see. And my child, who had never slept through the night, not once, in 11 months, slept. She woke up once. The next night, she slept. The night after that, she slept. Apparently my child can’t handle freedom. My child needed walls to feel secure. And I breathed a sigh of relief, and I slept. And I slept. And all of a sudden it wasn’t so overwhelming, and the world wasn’t as dark, and I enjoyed parenting again. And that was huge. So- to all my mamas out there, struggling to commit and stay committed to a philosophy, who are trying so hard to get through and be the perfect Montessori or RIE or Waldorf or attachment or whatever parent- sometimes, letting go is the best thing you can do. It’s okay. Follow the child, and you won’t go astray. And a huge thanks to my husband, parents, and friends who helped me take care of Noora when I hadn’t slept and wasn’t capable. And a massive, eternal thanks to my pal, Christie of Aid to Life Education, for recognizing me in a bit of a crisis and giving me the permission I felt I needed to deviate from the plan. (Seriously, any parents in the Lower Mainland area should attend her classes- she's magic). This happy baby sleeps through the night. Will wonders never cease?